Blackjack strategies can be different of course and each of strategies you use for playing this card game is workable; but the basis of all blackjack strategies is a blackjack basic strategy which had been created to decrease the house edge and give more chances for a gambler to win or just decrease his/her losses. Speaking about a soft hand, it should be said that a soft hand is every blackjack hand of 2 initial cards which contains an Ace and this Ace can be counted as 11 without busting. 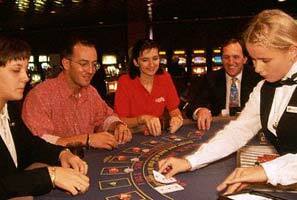 Let's have a look at the steps which a basic blackjack strategy proposes a player to do in different situations. So, you sit at blackjack table, wagers have been made already and a dealer gives you your two initial cards. You have a soft hand. What will your next step be? If you have soft 13-14 - double if a dealer has 5 or 6 points. Otherwise - hit! If you have soft 15-16 - double if a dealer has 4-6 points. Otherwise - hit! If you have soft 17 - double if a dealer has 3-6 points. Otherwise - hit! If you have soft 18 - double if a dealer has 3-6 points; stand if a dealer has 2-8 points; hit if a dealer has 9, 10 or an Ace! If you have soft 19-21 - stand! This result is good enough, and you will hardly get a better variant if you double or hit this hand. Looking for the info concerning a hard hand strategy? Look here.